Stonehenge. In reality, it’s a bunch of really big rocks arranged over the Salisbury plain in England. While the lintels (the huge stones laid horizontally across the tops of the upright ones) make it unlike any other manmade stone formation, Stonehenge is still like the constellations, all its meaning has to come from your own mind. And no other neolithic arrangement of boulders has fired more imaginations and conjecture than this one. It’s druids and ancient rituals and it represents a life and a culture that we can scarcely imagine from the 21st Century. The Stonehenge mystery permeates English culture, a symbol of a heritage that goes back much further than William the Conqueror, much further than the Roman Conquest. Recent research suggests that the site was occupied as far back as 7000 B.C. Those humans might have been similar to us physically (except for size, we’re a way taller species than we used to be), but their lives would have been completely unrecognizable to us, as well as to what significance they would have given their mysterious sacred sites. Stonehenge has been linked to everything from Arthurian legends to Thomas Hardy’s Tess of the d’Ubervilles to Doctor Who. And it’s not just the English. Americans have appropriated it for themselves in movies like This Is Spinal Tap and National Lampoon’s European Vacation and Kurt Vonnegut’s book about ancient astronauts, The Sirens of Titan. Stonehenge has been portrayed over the centuries as an altar for human sacrifice, an astronomical computer, and even a massive musical instrument. Over eight hundred thousand people visit the site each year. So why do we care so much about a bunch of rocks assembled by a group of prehistoric savages? What’s it about Stonehenge that fascinates people all over the world? The great Stonehenge Mystery Who made it, why, and what does it mean? Wendy shares a bit of her experience visiting the monument as a child. Mike’s grand tour of the UK included almost everything BUT Stonehenge, so he has at least one very good reason to return. From the Neolithic (~10,000 B.C. to ~5-2,000 B.C.) or “New Stone” Age, Stonehenge was created before modern tools (forged from metal) existed. This contributes to the mystique, begging the question, how on earth was it built? The pillars of this megalithic structure originated from the Wales region. So how did they end up in Southern England, over a hundred miles away? And why was this curious place built? A recent theory, by archaeologist Mike Parker Pearson, suggests that it began as a burial ground for important families around 3,000 B.C. Many cremated human remains as well as relics of a concentric wooden megalith were found within Stonehenge as it currently stands, suggesting a graveyard existed at the location before the stones were erected. Perhaps the stones were added at a later time in order to create a permanent memorial for the dead? Pearson also proposes that the monument may have been a building project symbolizing union of the people from eastern and western Britain following years of war between them. As isolated tribes from around the country began to intermingle, the project would have been a central meeting ground to celebrate the new found peace and unity of Britain. One of the first known Stonehenge researchers, John Aubrey, believed it had an astronomical/calendrical role. This theory was based on his careful measurements and surveying of the landmark. The location may also have been used to celebrate the solstices… Alignment of some of the pathways with the rising and setting sun during the summer and winter solstices suggest this possibility. Many others believe it served as a sacred religious meeting place for the Druids. The Arthurian legend incorporates it frequently, such as in the Marion Zimmer Bradley novel The Mists of Avalon. In some versions of the folk tale, the wizard Merlin creates Stonehenge with the help of a giant or giants who carry the large stones from Ireland. Thomas Hardy uses Stonehenge as a setting in Tess of the D’Ubervilles, portraying the monument as a giant instrument or “temple of the winds”. Author Patrick Rothfuss incorporates Stonehenge imagery in The Name of the Wind, wherein monuments referred to as waystones play key roles in the stories. A movie adaptation of Tess of the D’Ubervilles from the 1970s included a full scale replica of the megalith as its set. One of our favorites, This is Spinal Tap, includes a Stonehenge storyline inspired by Black Sabbath. The stage at real life venue Shank Hall in Milwaukee has a miniature Stonehenge backdrop as an homage to this part of the movie. Here is a video of our band Sunspot performing at Shank Hall over a decade ago. Notice the wee rock formation behind us on the backdrop? Dr. Who – An episode called “The Stones of Blood” includes some rocks of Stonehenge coming to life and killing people. Another episode, “The Pandorica Opens” included a prison located beneath Stonehenge. Like the pyramids, some people believe aliens built Stonehenge. They think it is an astronomical observatory through which the ancient Britains could keep track of the extraterrestrials who had visited and created Stonehenge for them. Conspiracy theorists believe the Anunnaki (check out Episode 3 for more about them!) built Stonehenge as a gathering place for the Illuminati. 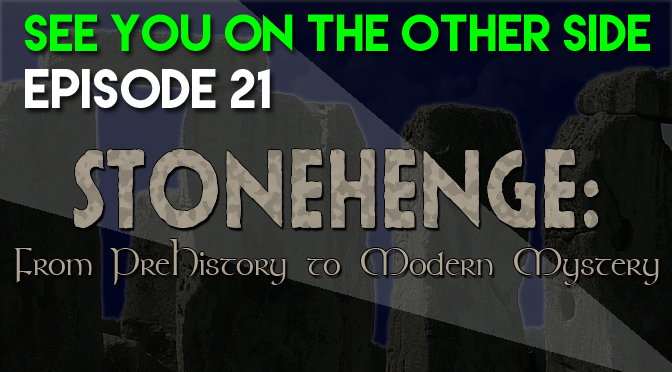 Do you have any of your own theories about Stonehenge? Have you visited it in person? Know of a book, film, or television show featuring this wondrous landmark that we didn’t cover? Please let us know! Voices from the Dawn article on Stonehenge – An excellent summation of the folklore and myths surrounding the landmark. It goes from quoting Geoffrey of Monmouth on the Arthurian aspect to Erich von Däniken from Chariots of the Gods. If you only read one article on it, make this one it. Clonehenge – A list of Stonehenge replicas around the world. You might not be able to get up close and personal to the real thing but you can probably climb a replica. It’s also a great source for finding movies and books about the megalithic circle. Stonehenge scene from Roman Polanski’s Tess – This is where they built the life-size model in France for shooting up close. See how real you think it looks! The Stonehenge scene from This Is Spinal Tap – This is the reason most people associate rock music with Stonehenge, and it’s just as funny as it was in 1984. Stonehenge Conspiracy Theory – It’s just about as crazy as you think it’s going to be. A highly entertaining read! Doctor Who Speech at Stonehenge from “The Pandorica Opens” – This is one of the greatest scenes of all time from the series as the Doctor climbs one of the megaliths to deliver one of his most rousing and speeches to an amassed force of his nastiest enemies. Watch out for the Killer Rocks! – Another Doctor Who scene, this one from 1978’s “The Stones of Blood” where you can see one of the stones attacking the Doctor. Something so old you know it in your bones. But you’ll never find the way alone. and come to the stones. humans fresh out the cave. And we sacrifice ourselves upon the stone. something so old, know it in our bones. Back to the source, back t the source. And we’ll get there some day.